The best archive of free HD action effects. Download pre-keyed effects now. This web page serves as the legal terms and conditions for all websites which are owned and operated by ProductionCrate LLC, and includes a non-transferable use license which permits you to download and use their resources, and describes any limitations thereof. ProductionCrate LLC offers our Platform where authorized users may access music, sound assets, image assets, and/or video assets owned by ProductionCrate LLC (hereinafter “Media Elements”). 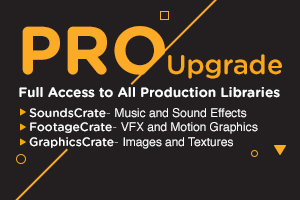 ProductionCrate LLC offers both free and premium members of our Platform a limited, non-transferable license for use of our Media Elements, without any warranty expressed or implied (hereinafter “License”). The License is subject to the terms, conditions and limitations herein. Our Media Elements can be incorporated into films, commercials, online videos, audio books, video tutorials, games, and 3D animations (hereinafter “Productions”), including Productions that you intend to sell or collect revenue from. We do not require that any of our users provide attribution on their Productions by referencing us in the end credits, but we may ask that users with free accounts do so if possible as it helps us and helps the community learn about how the effects are utilized. It is understood that ProductionCrate LLC does not grant, sell or transfer any ownership of copyright of its Media Elements and its Media Elements are to be exclusively distributed by our Platform. Our Media Elements may not be redistributed by any means under any circumstances. We require that our Media Elements are never uploaded to any websites, servers, peer to peer networks, data centers, online archives, or other third-party applications not affiliated with us without our prior written consent. You agree to not access or attempt to access any files or functions on any server operated by ProductionCrate other than through the user interface provided by us. Additionally, you agree to not use any web scrapers, automation scripts, or tethered-bot-networks to access our Platform or to download the Media Elements as doing so could negatively affect the experience of other users. Use of such automation tools may trigger account limitations by our firewall, and/or account termination. ProductionCrate LLC requires that the Media Elements are not used for any purpose that may violate any laws of the United States of America, or International Law. You agree to be responsible for your Productions being made in a safe and legal manner, and to release ProductionCrate LLC and our sponsors/affiliates from any and all liability related to your use of our Platform and/or our Media Elements. All Media Elements and our Platform are the property of us and are protected by copyright, trademark and other intellectual property laws. "ProductionCrate LLC" and productioncrate.com, footagecrate.com, soundscrate.com, and graphicscrate.com, are trademarks of ProductionCrate LLC. The visual appearance of our Platform is protected trade dress of ProductionCrate LLC under 15 U.S.C. § 1125 et seq. Our Platform and Media Elements "As Is". OUR PLATFORM, OUR SERVICES AND OUR MEDIA ELEMENTS ARE PROVIDED “AS IS” WITHOUT ANY REPRESENTATION, WARRANTY OR GUARANTY OF ANY KIND, EITHER EXPRESS OR IMPLIED, INCLUDING ANY IMPLIED WARRANTIES OF MERCHANTABILITY, FITNESS FOR A PARTICULAR PURPOSE OR TITLE, ALL OF WHICH ARE EXPRESSLY DISCLAIMED. WE DO NOT REPRESENT OR WARRANT THAT OUR PLATFORM, OUR SERVICES AND THE MEDIA ELEMENTS WILL MEET YOUR REQUIREMENTS OR THAT THEIR USE WILL BE UNINTERRUPTED OR ERROR FREE. THE ENTIRE RISK AS TO THE QUALITY, PERFORMANCE AND USE OF OUR PLATFORM, OUR SERVICES AND THE MEDIA ELEMENTS IS WITH YOU. By inputting any information on our Platform, you are consenting to receive communications from us electronically and you agree that all agreements, notices, disclosures and other communications that we provide to you electronically satisfy any legal requirement that such communications be in writing. Premium membership payments are processed by third-party payment service providers such as PayPal and Stripe. Those transactions are subject to the terms and conditions published on the website of the corresponding payment service provider. Subscription fees are processed at the start of each payment cycle until canceled by yourself, by a member of our team, or by the payment service provider. You may cancel your membership at any time by deactivating the payment profile on the corresponding payment processor's website, or by contacting us by e-mail at support@productioncrate.com. Premium membership payments are non refundable, additionally we do not provide refunds for any unused portion of a premium membership plan. Premium membership payments are processed by third-party payment service providers such as PayPal and Stripe. Those transactions are subject to the terms and conditions published on the website of the corresponding payment service provider. Subscription fees are processed at the start of each payment cycle until canceled by yourself, by a member of our team, or by the payment service provider. You may cancel your membership at any time by deactivating the payment profile on the corresponding payment processor's website, or by contacting us by e-mail at support@productioncrate.com. Members will not be refunded for any unused portion of their premium membership plan.